The last few months have been very busy for us. We became parents of our little girl in December. She’s the most amazing thing that has happened to us, the miracle of life. 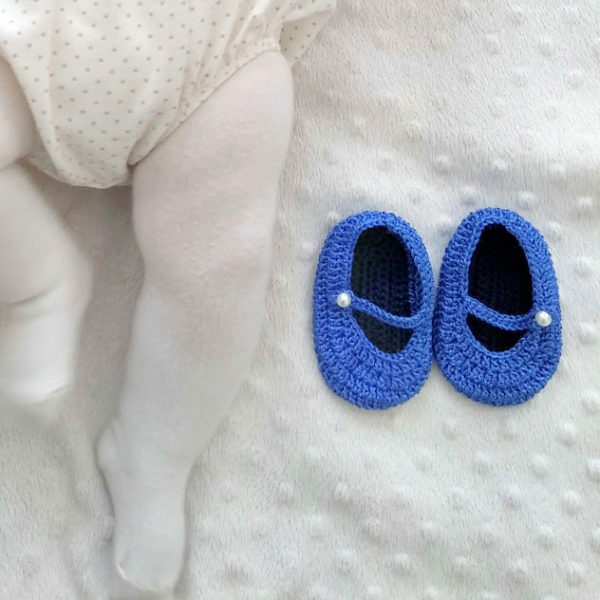 My pregnancy was quite good, so after the 1st trimester I was able to make clothes for her, I tried to knit and sew as much as possible, some of them lasted very little and some others still fit nicely. 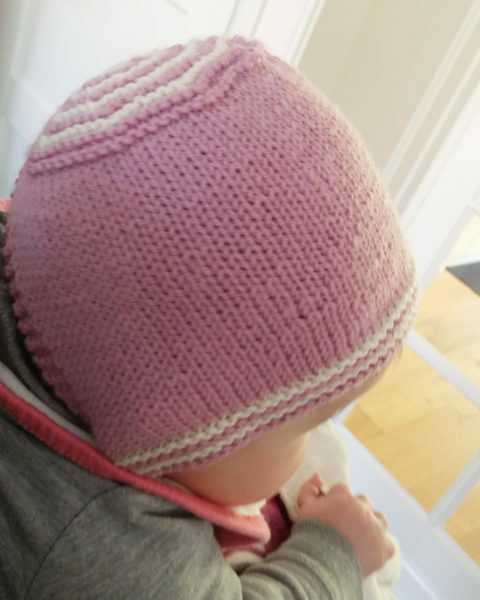 One of those things was this Sweet Stripes Bonnet on Ravelry; I made a couple of them for a baby up to 3 mo. 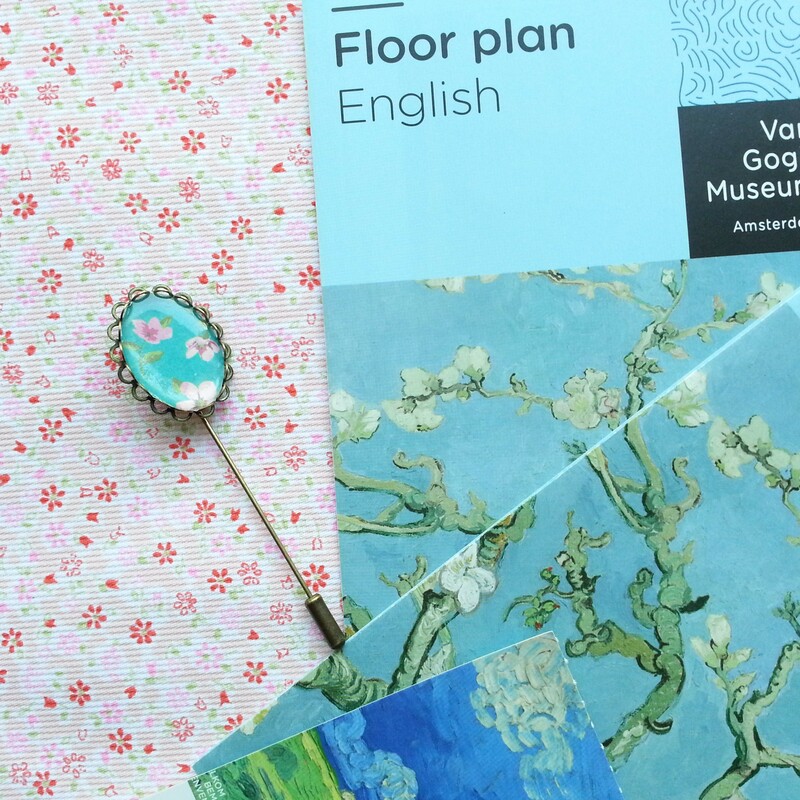 To celebrate Mother’s Day I’d like to offer the pattern for free to my readers. Whether you’re a mum, a grandma, an aunt or just a friend you can make as many as you like, and we’d love to see all of them. Sweet Stripes Bonnet. 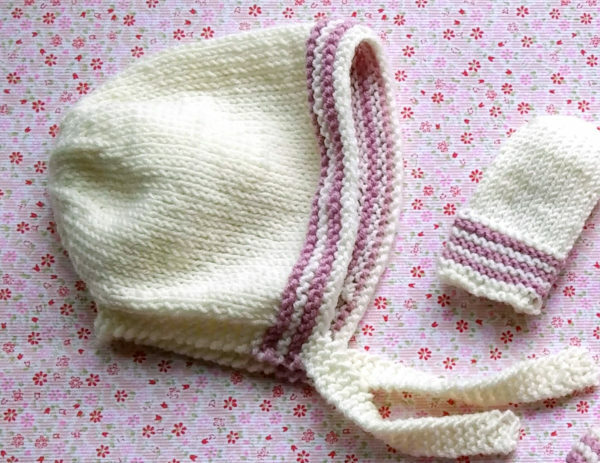 Free pattern 0-3 mo. 70 metres / 80 yards of Baby Merino by Drops (100% merino, 191 yards (175 meters, 50 grs) or any sport weight yarn for main colour (MC), in off white or old pink. 2-3 mts / 6 yards of the similar yarn in a contrasting color, CC (old pink or white) for the stripes. 3.5 mm [US 4] straight or any length circular needles. 23 sts by 32 rows in St st using 3.5 mm needles. 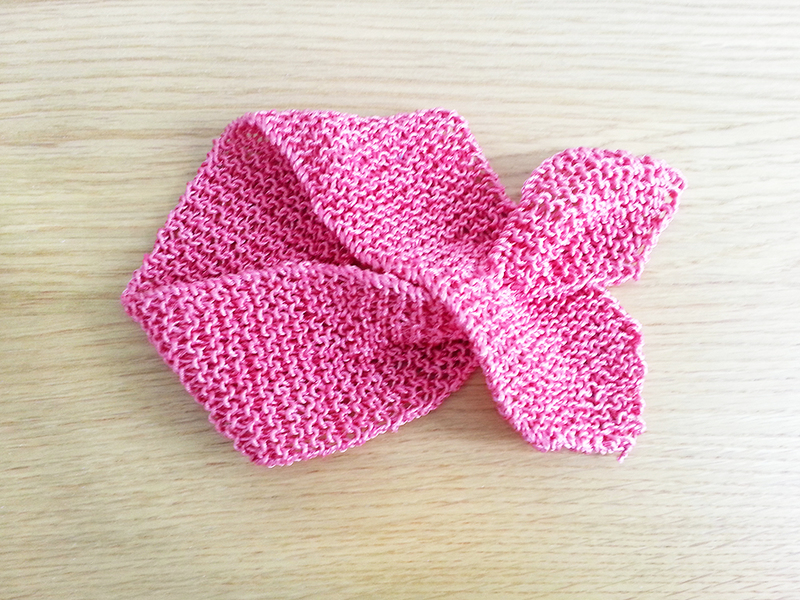 Using MC: CO 70 sts and knit 2 rows. Change to CC and knit 2 rows. Repeat last 4 rows one more time. MC: Work in St St (except 4 sts on both sides, worked in garter st) until the piece measures 12 cm. 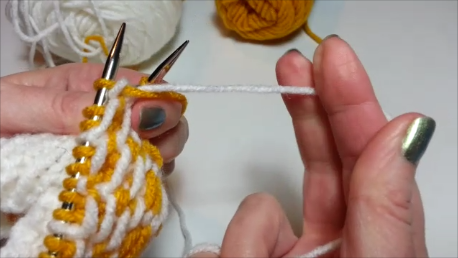 Join the 4 edge sts by using the Kitchener stitch method or a crochet hook, and join in the round. 62 sts. 1st round: m1 by elevating the bar between sts, k1, BO the 1st st, k6, *pm, k6, k2tog* repeat ** to last 7 sts, k7, m1 as before and BO the last st.
2nd round: knit across. 56 sts. 3rd round: *k5, k2tog, sm,* repeat ** to the end of the round. 48 sts. 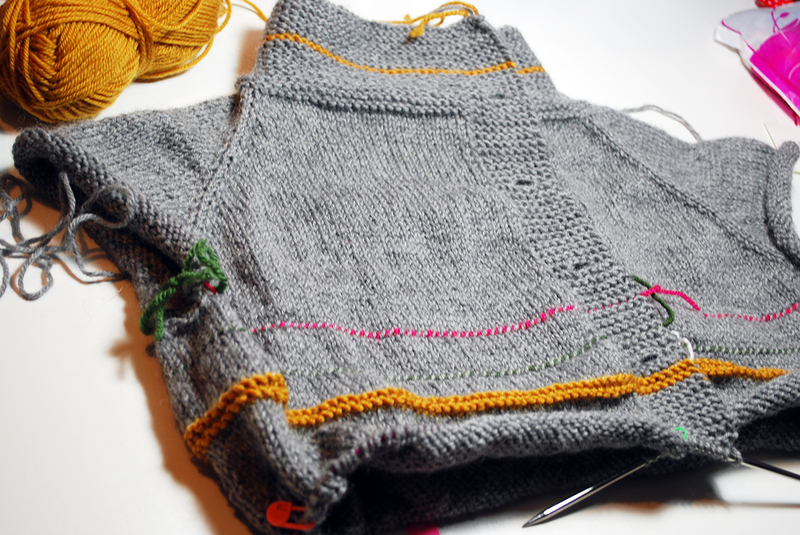 Repeat the last 2 rounds until 8 sts are left on your needles. Cut and leave a tail of 10 cm/4″ and sew through the sts twice to secure them. Straps: With MC, pick up and knit 4 sts at the front edges, knit 22 rows and BO. Repeat on the other side. This pattern is intended for personal use only. Feel free to share the love and give credit by linking to my blog. Our little daughter will turn 5 mo next Thursday. May 12, 2016, until then you can get any of my individual patterns with a 50% discount. Use the code “mumsday” during checkout. Patrón en castellano. Sweet Stripes Bonnet. 0-3 meses. 70 metros / 80 yardas de Baby Merino de Drops (100% merino, 191 yardas (175 metros, 50 grs) o cualquier lana tipo sport para color principal (CP), muestras en blanco roto y rosa viejo. 2-3 mts / 6 yardas de una lana similar en color contraste, CC (rosa viejo o blanco roto) para las rayas. 3.5 mm [US 4] rectas o circulares. Tomar medidas después de bloquear. 23 ptos en 32 vueltas en punto jersey usando agujas de 3.5 mm. Es recomendable comprobar la tensión. Utilizando color principal (CP): Monta 70 pts y teje 2 vueltas del derecho. Cambia a color contraste (CC) y teje 2 vueltas. Repite las 4 vueltas una vez más. CP: Trabaja en punto jersey (excepto 4 pts en ambos lados, hechos a pto bobo) hasta que la pieza mida 12 cm. Une los 4 ptos de ambos lados (utiliza kitchener stitch o una aguja de ganchillo) para tejer en redondo. 62 pts. 1ª vuelta: Aumenta 1 (a1) elevando el hilo entre los ptos, d1, cierra el 1er pto, d6, *pm, d6, 2dj* repite ** hasta los últimos 7 pts, d7, a1 como antes y cierra el último pto. 2ª vuelta: Teje derecho. 56 pts. 3ª vuelta: *d5, 2dj, sm,* repite ** hasta el final de la vuelta. 48 pts. Repite las 2 últimas vueltas hasta que queden 8 ptos en las agujas. Corta la lana dejando unos 10 cm para rematar los puntos. Tiras: Con CP, monta 4 puntos sobre la pieza, el método pick up and knit, teje en pto bobo durante 22 vueltas y Cierra. Repite en la otra tira. El patrón está destinado a uso personal únicamente. Puedes compartirlo y enlazar a mi blog. Promoción de mis patrones individuales en Ravelry. Celebramos el día de la madre hasta el próximo jueves 12 de mayo. Utiliza el cupón “mumsday” durante la compra para obtener un 50% de descuento. Muchas gracias Laurix! Espero que vosotros estéis muy bien. Un beso!